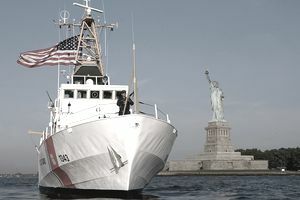 The Coast Guard is a maritime, military, multi-mission service unique among the U.S. military branches for having a maritime law enforcement mission (with jurisdiction in both domestic and international waters) and a federal regulatory agency mission as part of its mission set. Currently, the Coast Guard operates under the Department of Homeland Security during peacetime but can be transferred to the Department of the Navy by the president at any time, or by Congress during the time of war. The Coast Guard's enduring roles are maritime safety, security, and stewardship. The Coast Guard motto is Semper Paratus, "Always Ready." Formerly, the Coast Guard was part of the Department of Transportation, but soon after the terrorist attacks of September 11, 2001, the Coast Guard roles were upgraded to a more anti-terrorism and port protection as well as other lifesaving, shipping security, and drug interdiction duties. As one of the nation's five armed services, the Coast Guard has been involved in every war from 1790 to Iraq and Afghanistan. It was officially established as the Revenue Marine by the Continental Congress at the request of Alexander Hamilton. Its first purpose was to collect customs duties in the nation's seaports. By the 1860s, the service was known as the United States Revenue Cutter Service. The Coast Guard was formed from the merger of the Revenue Cutter Service and the United States Life-Saving Service in 1915. The Coast Guard is one of the more difficult branches to join because it accepts far fewer new recruits than the other branches of the military. The Coast Guard requires a minimum of 54 points on the Armed Services Vocational Aptitude Battery test, but you should do better in order to be competitive with fellow recruits. You will need a high school diploma or college degree. If you have a GED, it will probably be difficult to be accepted into the Coast Guard. You will have to undergo a credit check and pass a security clearance check. The Coast Guard generally approves the lowest rate of criminal history waivers and medical waivers (in fact, it is the only branch for which a shellfish allergy is a non-waiver-able condition). They invite prior service applicants with some rules and restrictions. The Coast Guard offers a small variety of enlistment incentives to entice qualified applicants to join. They recommend discussing current incentives with a recruiting officer. The Coast Guard participates in the Post-9/11 GI Bill, which provides up to 36 months of education benefits for 15 years after your release from active duty. Like the other services, the Coast Guard offers advanced enlistment rank up to E-3, for such things as college credits or JROTC. Deck & Ordnance - Maritime Enforcement Specialists (ME), Boatswain's Mate (BM), Gunner’s Mate (GM), Operations Specialist (OS), and Intelligence Specialist (IS). The Coast Guard only has one location for enlisted basic training: Coast Guard Training Center Cape May in Cape May, New Jersey. You should know how to swim prior to joining the Coast Guard. All Coast Guard personnel must be able to jump off a 5-foot platform into a pool, swim 100 meters, and tread water for five minutes. Helicopter Rescue Specialist (Search and Rescue Swimmer) that has a much more grueling test and training program to qualify with the additional exercises of pullups, underwater swims, buddy tows, and 500m swims. Maritime Security Response Team (MSRT) - The MSRT is the SWAT Team of the Coast Guard and the only unit within the Coast Guard that has counterterrorism capabilities. The MSRT is trained in direct action missions and to be the to be the first response to potential or actual terrorist threats. A similar test with higher standards is required for the MSRT recruits (12-minute swim, 1 1/2 mile run, pushups, situps). The Coast Guard has Installations, Bases, and Air Stations throughout the continental United States East Coast, Gulf Coast, Great Lakes and Pacific. Depending upon what type of ship a Coast Guardsman is assigned to, he/she could live on that ship, or on the base, if the ship is not big enough to accompany the crew full time. However, some ratings have a sea time requirement for advancement (your recruiter should have a list of which ratings require sea time). As well, like the rest of the branches, the Coast Guard has overseas assignments and special assignments (such as recruiting). The vast majority of Coast Guard deployments are at sea on Coast Guard ships. Just as with the Navy, if you don't want to deploy on ships or submarines, don't join the Coast Guard. Like the Navy, the larger ships are small cities and can deploy overseas. As with members of the other Reserve Components, Coast Guard men and women are subject to involuntary mobilization under Title 10 for national security contingencies. However, unlike members of the other Reserve Components, Coast Guard Reservists can also be involuntarily mobilized for up to 60 days at a time for domestic contingencies, including natural disasters and terrorist attacks. Individuals enlisting in the Coast Guard can receive advanced promotion, up to the rank (rate) of Seaman (E-3), for such things as college credits, JROTC, Eagle Scout, Civil Air Patrol, etc. Coast Guard Enlisted are promoted to E-2 after the completion of boot camp, and while advancement to E-3 is virtually automatic, an E-2 is has certain performance qualifications and nonresident exams required before a recruit is eligible. In addition, some ratings have a sea time requirement for advancement. Like the other services, the Coast Guard offers a chance for qualified enlisted sailors to finish college and earn a commission as a Coast Guard Officer. The advancement programs can change over time as they need more or fewer of different officer specialties. Should I Join the Military to Escape a Troubled Background? What Is the History of the Navy Uniform?